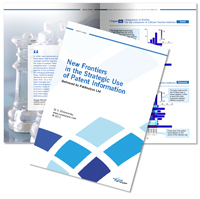 "New Frontiers in the Strategic Use of Patent Information"
The complex nature of the valuation of intellectual property provides a clear and strong justification for the rigorous due-diligence studies which PatAnalyse is well placed to undertake. Each in-licensing deal has its own unique issues of patent valuation. The estimated value of the licensed technology is usually based on the projected cash flow for the products underpinned by the licensed technology including the level of remaining investment required for brining such new products to the market. However the level of achievable profit margins for such new products is strongly dependent on the monopoly rights provided by the patented technology. Usually two key judgments – evaluating the offensive strength of the patents considered for in-licensing and evaluating the remaining implicit threats from the third party patent thicket surrounding the technologies required for manufacturing the new products – cause the main difficulties for business executives. Many companies use the external services of brokers with deep technical and market knowledge in the field to assist with such value assessments. Simultaneously the firms often seek further strategic advice from such knowledgeable brokers. Such advice may concern their acquisition strategy for establishing market position, protecting their business activities and bolstering their licensing negotiations. The complex nature of the valuation of intellectual property provides a clear and strong justification for the rigorous due-diligence studies which PatAnalyse is well placed to undertake. Indeed in-licensing due-diligence studies have many similarities to the invalidity search, freedom-to-operate analysis, and patent landscape studies which PatAnalyse provides as stand-alone services. The appropriate extent of the due diligence for in-licensing deals should be determined mainly by the initial perceived value of the transaction. as the final step we determine who actually owns the relevant intellectual property. does the client need a license? if he takes the license will he be able to use the anticipated commercial technology? if everything necessary to practice the licensed technology is going to be transferred? what is the license worth? In some instances, the due-diligence study will reveal information that will result in adjustment of the terms of the agreement, including the royalty. In other situations, the due-diligence may reveal information that precludes the deal altogether. Using our technical and business insight we aim to propose creative solutions for most of the problems identified in a due-diligence study.